It has been a cruel year for 5-year-old Tylerann Zadroga, and last week proved especially difficult. At her suburban New Jersey day care center, Tylerann could only watch as the other children made Father's Day cards. "She's been upset the last few days," said her grandfather, Joseph Zadroga. "She's really been missing him." Seventeen months after James Zadroga died of a respiratory disease triggered by World Trade Center toxins, doctors and politicians have gradually awakened to the ballooning health crisis stemming from the worst terrorist attack in U.S. history. The debilitating - and increasingly deadly - illnesses plaguing recovery workers are now well documented. Of the 70,000 people taking part in Mount Sinai Medical Center's World Trade Center health study, 85 percent are suffering some kind of respiratory problem. Medical experts now say the toxic cloud sparked at ground zero has not only caused severe breathing problems in the short term but also will likely spawn diseases like cancer in the years to come. The mounting medical evidence has put pressure on lawmakers to fund monitoring and treatment for sick responders. Still, resentment and desperation lingers among the ailing workers and the families of 9/11's delayed health casualties. They say not enough is being done to treat, support and honor the terrorist attack's forgotten victims. "If Bush can send $15 billion to Africa over five years for AIDS treatment, I'm sure he could find $1 billion a year to help these people," Joseph Zadroga said. For the workers besieged by ground zero-related illnesses, the pain has been increasingly unbearable. Bonnie Giebfried was buried alive in the debris of the Trade Center's south tower. The former EMT suffers from numerous ailments, including asthma, nerve damage and sciatica. But Giebfried says the emotional fallout has been equally as draining for sick responders. Surviving 9/11 responders are falling into dark clouds of depression, drugs and even suicide, she says, and with disabled parents unable to work, family dynamics are crumbling. View a photo essay of 9/11's toxic aftermath. Former EMT Bonnie Giebfried details her health woes. Giebfried remembers the horrific scene of Sept. 11, 2001. Read the story of NYPD Detective James Zadroga. The struggles are also financial. Because Giebfried was employed by a private hospital on Sept. 11, 2001, she was not considered a "uniformed" city worker and thus did not qualify for three-quarter salary benefits afforded to sick responders who worked for the city. She lost her chance at getting a disability pension at work because she fell six months shy of qualifying. Her union cancelled her medical and prescription drug benefits. Red tape and unbalanced assistance programs aren't just hurting Giebfried: In February, New York Mayor Michael Bloomberg's office released a report showing that 40 percent of sick ground zero workers have no insurance or inadequate coverage. "People don't know how we're existing every day, trying to pay bills, keep family structure and keep our heads above water," said Giebfried, who has lost all her savings to medical bills. "The government left us buried at ground zero." Earlier this month, Mayor Bloomberg appointed a new World Trade Center health czar for New York. Jeffrey Hon, a former spokesman for the Red Cross Sept. 11 Recovery Program, has the task of ironing out inconsistencies in the city's health benefits as well as working with programs tracking ground zero workers' health. That effort may be hampered by a statistic released just last week: Only half of roughly 70,000 members in the registry tracking post-9/11 illnesses have responded to follow-up surveys. The dwindling numbers are making the city's already-complex task of gauging the long-term health effects more difficult. Despite the monitoring challenges, the evidence already collected is indisputable. According to a major Mount Sinai study released last September, 70 percent of the roughly 10,000 ground zero workers tested said they experienced new or substantially deteriorated respiratory problems. More than one in four nonsmokers reported breathing problems - double the rate of nonsmokers in the general population. Also, the head of the World Trade Center Medical Monitoring Program said last month that several workers had developed rare blood cell cancers. The sick are slowly dying. Though the toll is undoubtedly higher, the deaths of at least four police officers (including Zadroga), a communications worker, an attorney and a nun have been directly linked to ground zero exposure. A class-action lawsuit claims dozens more have died from inhaling toxic debris from the Trade Center. Giebfried says she personally knows more than 20 colleagues who have lost their lives since becoming ill.
Dr. Michael Baden, chief forensic pathologist for the New York State Police and the former chief medical examiner of New York City, has reviewed several ground zero-related autopsies, including Zadroga's. He says the growing list of victims should make cities rethink their disaster-management plans in the future. "Three thousand people may have died, but 100,000 others may have been exposed," he said. Baden cautions that it could take two decades to gauge the long-term effects of the ground zero cocktail of asbestos, mercury, lead and other contaminants. Identifying and analyzing the plethora of potentially carcinogenic chemicals that wafted over the World Trade Center is a painstaking process, so festering diseases such as lung cancer can only be conclusively linked to the 9/11 down the road. But medical experts are already sounding alarms. Last month, the co-director of the World Trade Center Medical Monitoring Program warned that cancer would likely become the "third wave" of illnesses plaguing ground zero workers. Dr. Robin Herbert said the first wave refers to coughing and respiratory problems developed immediately after Sept. 11, 2001, and the second wave includes severe chronic lung diseases. One such disease, sarcoidosis, claimed the life of New York attorney Felicia Dunn-Jones in 2002. Last month, the city medical examiner added her death to the official list of 9/11 victims - the first such casualty added to the city's tally. That acknowledgment has prodded the government to provide more assistance. Rep. Carolyn Maloney, co-chair of the Congressional 9/11 Health Caucus, said there are many more victims that the city has not documented. Earlier this month, she and other New York delegates helped get $50 million for 9/11 health care and medical monitoring included in a new appropriations bill. Though Maloney is encouraged by the political progress on Capitol Hill, she expressed frustration with the administration's sluggish response to calls for a comprehensive long-term plan to monitor and treat sick workers. "Everyone who breathed deadly toxic fumes deserves to be monitored and examined and everyone who is sick deserves to be treated," Maloney said. "We've been promised a plan for well over a year, but we have yet to see it." Maloney and Rep. Vito Fossella recently re-introduced the James Zadroga 9/11 Health and Compensation Act. The bill would extend and improve the federal government's long-term medical monitoring, treatment and compensation for those afflicted by ground zero toxins. So far, however, the measure has languished in Congress. Maloney has also urged New York's medical examiner to reconsider James Zadroga's death as a homicide. (New York still has not recognized his death as 9/11-related, despite a New Jersey medical examiner's ruling that it was.) Only an acknowledgment by the city would include Zadroga in the "official" tally of 9/11 victims. Only then would his name be added to the Sept. 11 memorial. "That's an honor he deserves," Joseph Zadroga said. Nearly six years after 9/11, the death toll from the terrorist attack continues to grow. NYPD Det. Robert Williamson died last month of pancreatic cancer his family says was caused by his recovery work at ground zero. 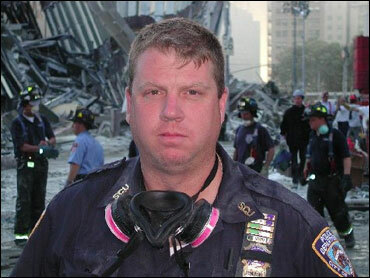 The 20-year police veteran toiled for more than 100 hours on the World Trade Center's pile of toxic debris before retiring in 2002 and ultimately falling ill.
Williamson, 46, left behind a wife, Maureen, and three children. He was finally awarded a disability pension last September - just days before the fifth anniversary of Sept, 11, 2001. Maureen Williamson says her husband was never angry about his condition even though he predicted the impending crisis while he was working among the ground zero toxins. "He said within weeks, 'A lot of people are gonna be very, very sick.' It was that obvious, he just knew it," she recalls. Maureen Williamson says doctors and lawmakers are finally confronting the magnitude of the problem. She credits the New Jersey medical examiner who conclusively linked Zadroga's death last year to ground zero exposure as a "monumental" turning point. Still, she says, the wake-up call may be too late for some. "We're coming around to admitting it and fessing up to it. It's taken this long to say people are dying from exposure down there," she said. "They're getting sick and they're so young. They've lived half their life, and they're getting robbed of the other half."